Drepung in Tibet was modeled after the great monasteries of Classical Buddhist India, namely, Nalanda and Vikramalashila, and was an institution dedicated to intense study of the traditional Buddhist arts and sciences. Its training program required twenty years of intense academic study, with rigorous testing and close supervision throughout, as well as six hours of debate each day. The focus of the program was the five major topics of Classical Indian Buddhism: philosophy, psychology, logic, metaphysics, and ethics. This was followed by an internship usually lasting five to ten years. After completing this course of study and training, the student candidate would be allowed to stand for the Geshe Lharampa degree. Drepung was one of only three monasteries in Central Asia with the authority to award this degree, regarded as the most prestigious honor in the Tibetan Buddhist world. The Chinese Communist takeover of Tibet in 1959 resulted in the destruction of all but a dozen of Tibet's 6,500 monasteries, and in the closure of Drepung, with most of the monks being either killed or imprisoned. Approximately 250 of Loseling's monks managed to escape the holocaust. 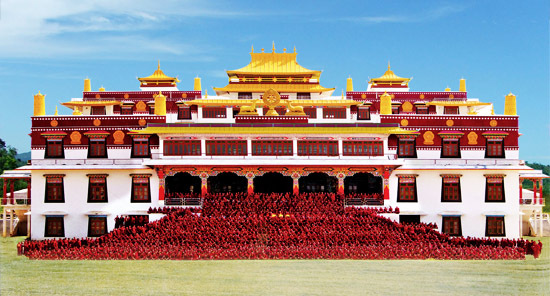 They were accepted as refugees in India, where eventually they built a replica "Drepung Loseling in Exile" monastery on land generously donated by the Indian government in Karnataka State, southeast of Bombay. Here they worked to preserve their ancient traditions. Over the years many more young spiritual aspirants have fled Chinese-occupied Tibet and sought entrance into the monastery, thus helping to preserve their traditional culture. 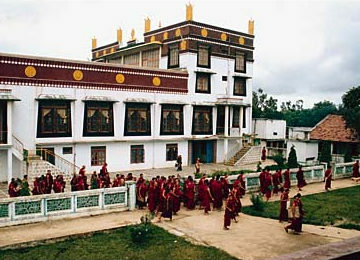 The number of monks presently in the re-established Drepung Loseling has increased to more than 3,000.